Wait ... did I really just say I'm going to paint my kitchen cabinets? I did. I really did. So, yeah, I tackled this project last fall knowing I was a little bit crazy to take it on. Life was busy, as life these days tends to be. 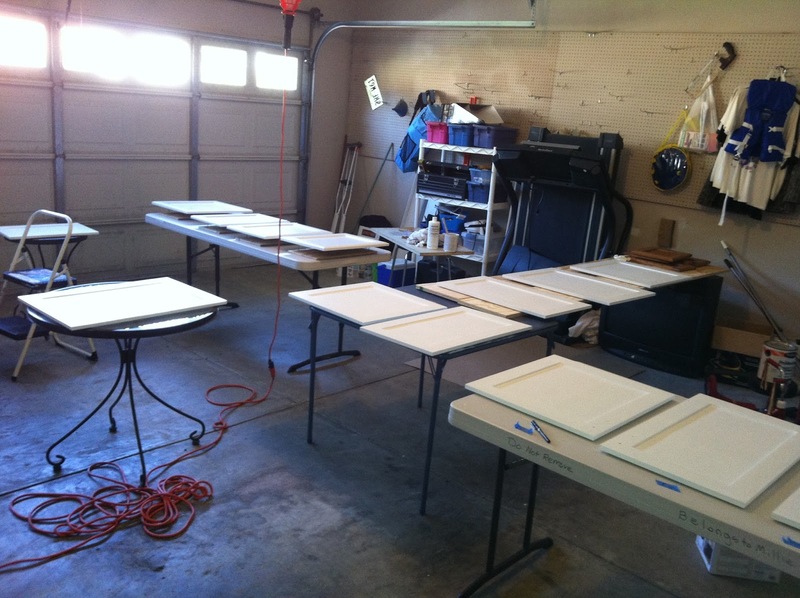 But in October 2012, my family and I put all that craziness on hold to spend three days cleaning, sanding, painting and sealing. Hold on, did I say three days? Ha-ha-ha-ha-ha. We spent three solid days cleaning, sanding and painting. That finished the cabinet boxes, basically, and got us maybe halfway through the 20 doors and seven drawer fronts. That was the amount of time we'd set aside for the project. Over the next several weeks we spent every spare minute -- which in our house are few and far between -- finishing up the details. Let's just say our garage was out of commission for at least a couple months. If you landed on this site from the column that just ran in The Commercial Appeal, that might mean you're contemplating a cabinet painting project of your own. And if that's the case, you've come to the right place. There was only so much info I could pack into 20 column inches of newspaper space. Here's the stuff I didn't get to say (and trust me when I tell you, the devil is in the details). First off, let me show you a photo of my kitchen "before." There's no better way to explain why I felt the need to refinish my 20-year-old cabinetry. Yep, that's a medium oak finish, white Formica countertops and a refrigerator straight out of the Sears catalog circa 1993. (No, seriously. It's a Lady Kenmore.) I inherited all of it when we bought the house, including the "wheat straw" paint on the walls. Luckily I inherited two good features, too — wide-plank walnut hardwood floors and cabinet boxes and doors that were in excellent shape. 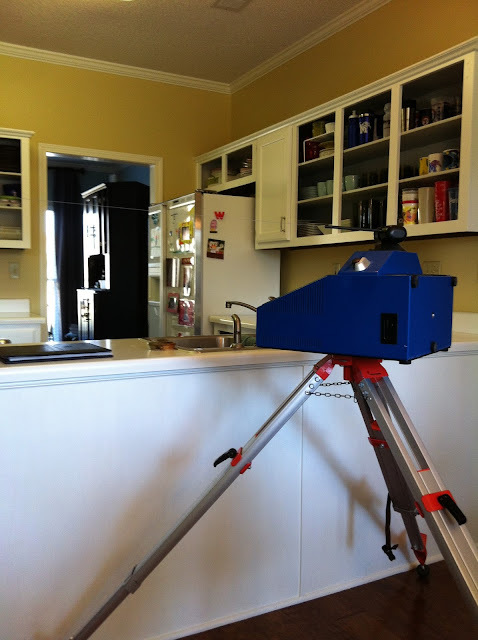 Both a good starting point for a new kitchen. 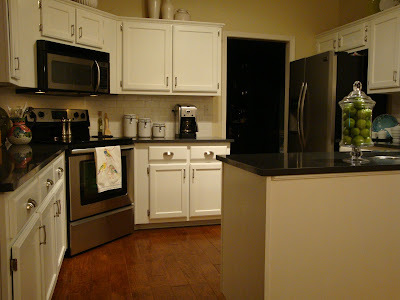 Because the cabinets were in good shape and I liked the layout of the kitchen, I decided to keep the existing cabinetry. I explored all options, meaning I talked to friends, neighbors and fellow designers about the benefits of hiring a professional painter versus having the cabinets refaced. 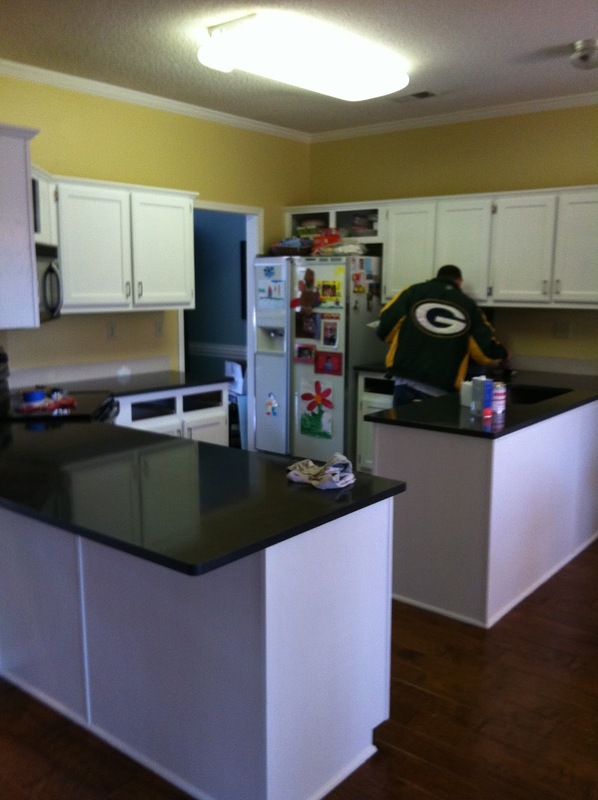 At the time I wasn't even considering the idea of painting the cabinets myself. I'd heard the stories, and I'm not particularly masochistic. 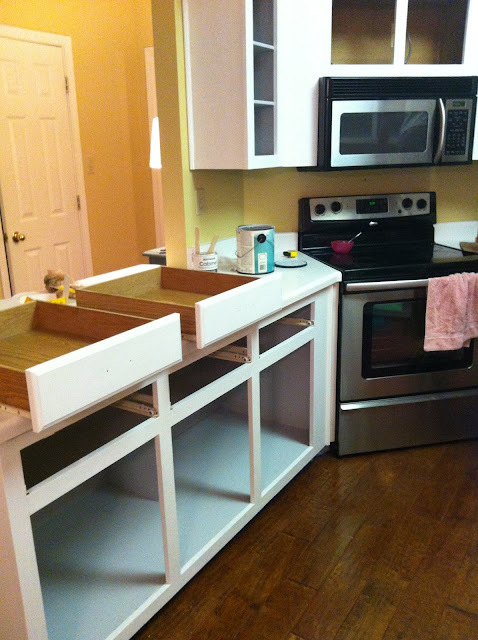 Then a friend asked me what I thought about this new cabinet refinishing kit called Rust-Oleum Cabinet Transformations. I hadn't heard of it, so, you know, what could I do? I Googled it. I was intrigued. In my research, I came across a blog post by someone who'd tried the kit with good results. I went to my local Home Depot store and checked it out for myself, and then I actually signed up for a class. Serendipitously, I suppose, the store had a "ladies' night" in the works on Cabinet Transformations, and there I was able to see samples, watch the instructional DVD and basically determine the project was doable. So, yeah, we did it. Here are a couple photos of the work in progress. And yes, by the way, my husband is wearing an Elvis T-shirt. Did I mention we live in Memphis? 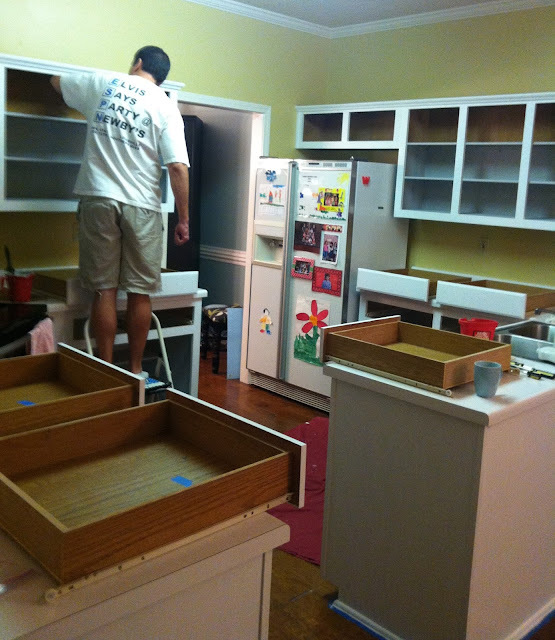 We used the refinishing kit on the outside of the cabinet boxes, the door fronts and the drawers. Inside the drawers and cabinets, I used a Sherwin Williams latex semi-gloss paint. At first, I bought the paint in white to match the cabinets' exterior, then I thought, "Whoa, wait a minute. This is a custom job." I could do whatever I wanted ... so I went back to the store and had the paint tinted to a gorgeous soft gray that makes me smile when I open my cabinet doors. Prepare your cabinets well. Take time to do a little sanding even if your paint kit says it isn't necessary. I scrubbed my cabinets inside and out, then I roughed them up with sandpaper, and then my husband used a deglosser that came in the kit to remove the remaining sheen. Make some sketches. I sketched out rough drawings of my cabinet elevations and numbered every cabinet door and drawer. Then I used painters tape (because it's not too sticky) to number the doors and drawers BEFORE removing them according to the numbers on my drawings. I placed all hardware in plastic bags labeled with the corresponding numbers, and I even separated top hinges from bottom hinges so the doors would hang exactly the same way they did previously. Be organized. Very, very organized. My cabinets required four coats of the "bond coat" product in the Rust-Oleum kit. I had to carefully keep track of how many coats the front and back of each door had received, taking into account drying times. With 20 doors and seven drawers to cover, that was no easy task. I kept running lists using the number system I'd created (note the blue painter's tape beside each door ... the number followed each door everywhere it went). Have all equipment on-hand. Buy everything you need, including tack cloth (very important), gloves, face mask (for sanding and deglossing, and keeping yourself from passing out while inhaling fumes for 72 hours), painter's tape, etc., before you get started. This project is time-consuming already — you don't want to have to run to the store four times in the midst of it. Also, make sure you have several high-quality synthetic brushes that are in excellent shape. I used 1.5" angled brushes for doors and drawers and 2" angled brushes for cabinet boxes. Finally, follow all instructions. Don't skip steps, whether you're using a kit or not. Prep rigorously, paint carefully and thoroughly, inspect your work often. Now for a word on paint. You can use basically any latex or alkyd paint for this type of project (oil or latex enamel works best, according to pro faux-finisher Donna Blackard), but I really liked the bond coat included in the Rust-Oleum kit. The paint was really, really thin, and that was very important for workability, especially when painting the doors. It also allowed the grain of the wood to show through, and the finished product looks pretty professional, if I do say so myself. 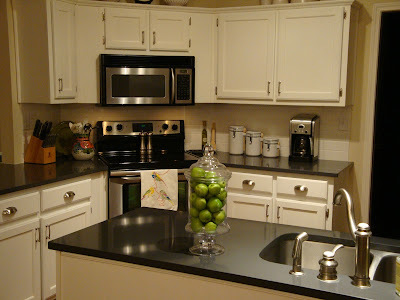 In fact, one of my proudest moments during the project was when my countertop installer walked in for our initial consultation and said, "Oh, I see you've already had your new cabinets installed." And, oh yeah, that broken monstrosity of a fluorescent light fixture dangling precariously overhead? It's gone. Gone the way of the Lady Kenmore fridge. I replaced the fixture with a farmhouse-style pendant track light and added recessed lighting above the sink. And we replaced the old fridge with a stainless steel, side-by-side, counter-depth Frigidaire. I've got to say, we all worked on it — me, my husband and our 6-year-old son — and we all pretty much love it. 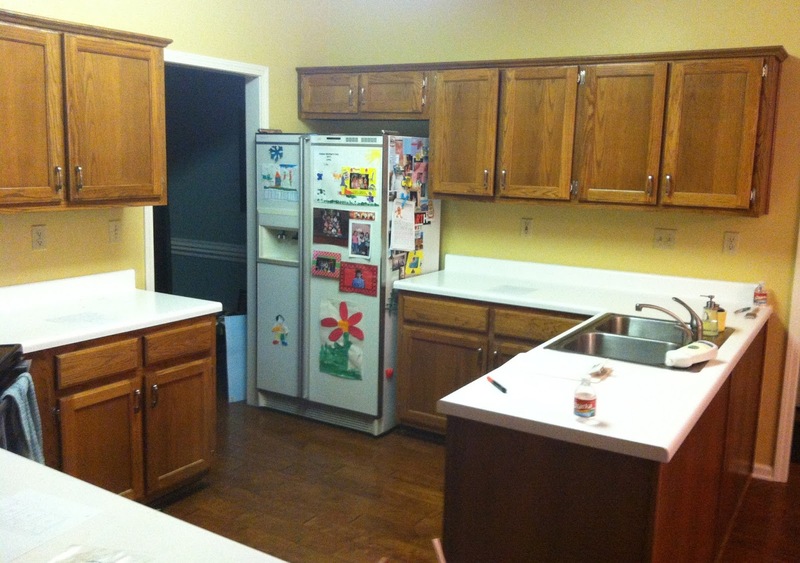 In fact, before writing this post I'd almost forgotten what the old kitchen looked like. So, am I happy I worked H-A-R-D to paint my own kitchen cabinets? Why yes, yes I am. I'd probably even do it again.